← Full Color Banner Impresses! This is a terrific way to do branding around a new corporate office- custom wallpaper of what you do, in this case forging. It’s called a word cloud, and it has wonderful impact! Mostly we print photographs when we do a wall mural, but lately we’ve seen more and more of this kind of word cloud art. 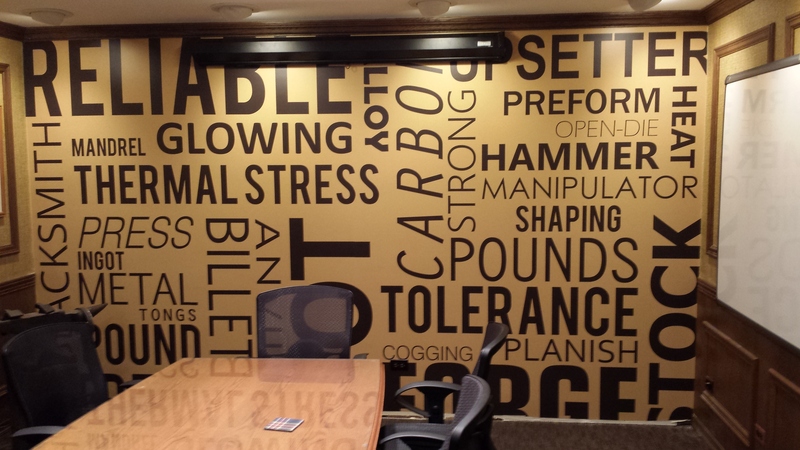 A conference room like this really talks about what your business is all about. That gets everybody on the same page, whether they are an employee or customer. Make a word cloud about your business, and then wallpaper from it, and everybody will know what your company is all about. This entry was posted in Custom Printed Wallpaper and tagged conference room wallpaper, corporate wallpaper, custom wallpaper murals, photo wallpaper. Bookmark the permalink.